Tasked with a colour pallet of rich earthy tones, a love of terracotta and a basic form loved by Nourish group, James Russ designed and handcrafted the Clay pendants. With weight being an issue, these pendants had to be a shortcut version of solid clay pots. Canvas and clay and some fine tuning resulted in light weight textured pots with a hint of brass. 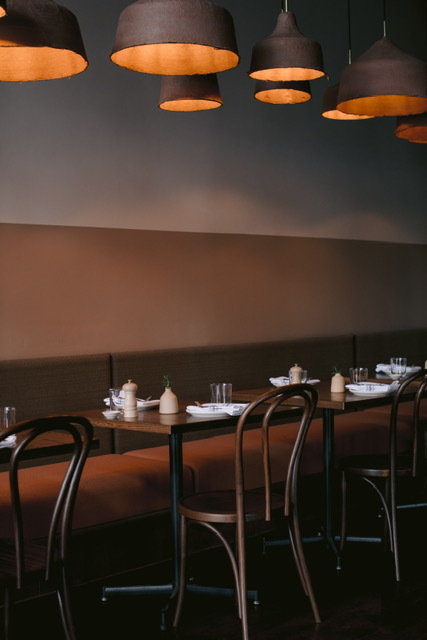 These cast a warm glow upon diners and add to the richness of the space.